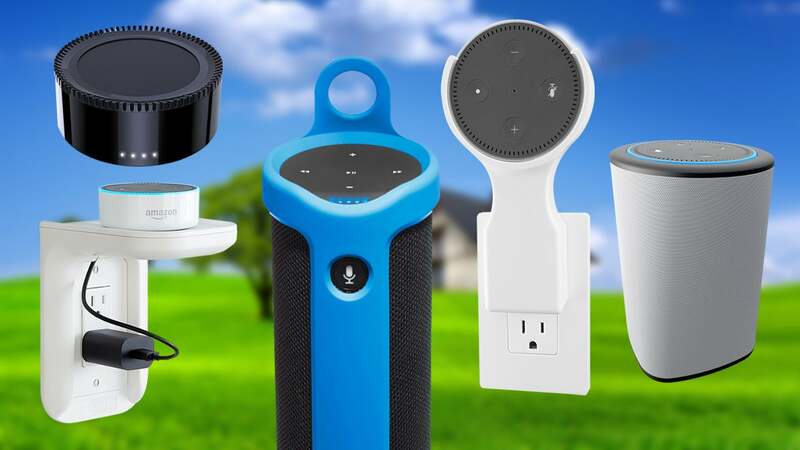 Thanks to the popularity of Amazon’s Echo smart speaker and Alexa digital assistant, a cottage industry of add-ons and accessories has sprung up to make the Echo, Echo Dot, and Echo Tap even better. Make your Echo/Alexa device portable. Improve the Echo’s sound quality. Hang your Echo device on the wall or even mount it inside your ceiling. A cornucopia of after-market gadgets can accomplish these tricks and more. We’ve put our hands on 16 of the best Echo accessories on the market so that we can not only inform you of their existence but tell you how they perform and let you know of any potential drawbacks. Updated March 25, 2019 to add our review of the Ninety7 Sky Tote Battery Base, an accessory that enables an Amazon Echo (2nd Generation) operate off battery power for up to eight hours at a time, so you can take the smart speaker with you anywhere. If you have an outlet that’s in the middle of your wall and unobstructed by design elements such as a countertop backsplash, Echogear’s Outlet Shelf ($15 on Amazon) can accommodate not just any Echo device but also larger devices such as a Sonos One speaker (there’s a weight limit of 10 pounds). This plastic shelf replaces your outlet cover (extra-long screws and metal plates for both styles of outlets are provided to secure it to the receptacle). The shelf is above the outlet, and the power cable passes through a hole in the back. The “legs” of the shelf are wide enough to accommodate even large wall warts, but it can be challenging to hide the excess cable for smaller items like an Echo Dot (you might want to replace the standard cable with a stub cable in such situations). Dock your second-generation Amazon Echo into this battery and you can take Amazon's latest smart speaker with you anywhere. While it's arguable whether this is a better solution for listening to music compared to a dedicated Bluetooth speaker, it is one of the best ways to take the power of Alexa on the road with you. 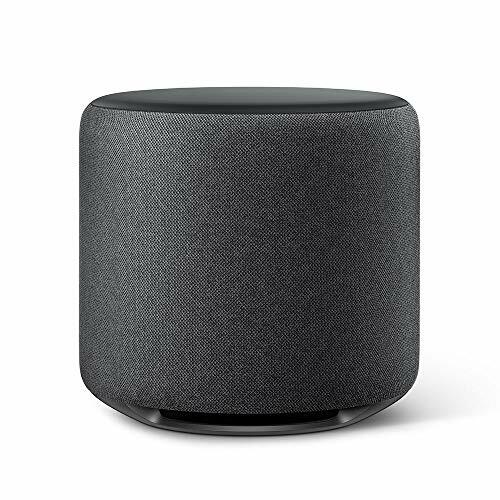 The Echo Dot is short, but its footprint is just as large as the full-size Echo. If the counter or tabletop space in your home is already overcrowded, Mount Genie’s The Spot ($14 each or $26 for a two-pack on Amazon) lets you hang the Dot from an electrical outlet, effectively reducing its footprint to zero. 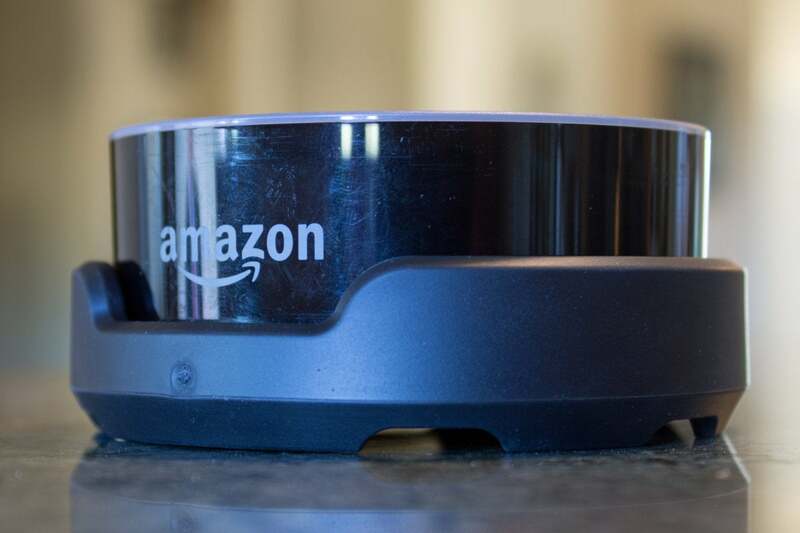 The Spot is a plastic cradle that holds an Echo Dot. It comes with a USB cable stub that plugs into the power adapter that came with the Echo Dot. The adapter fits inside a collar that the cradle hangs from. Flanges on the back of the mount extend to the wall, so that pressing the buttons on the Dot won’t pull the AC adapter out of the plug. The Spot can be used with vertical or horizontal outlets, but it will prevent you from plugging a three-pronged plug into the adjacent outlet in a duplex. Most outlets are installed about 12 inches above the floor, which isn’t an ideal location for either a speaker or a microphone. That goes double if the outlet you want to use is blocked by furniture. The Spot works great with outlets that are located above countertops (kitchens, bathrooms, wet bars, etc.) or in workspaces such as the garage. The Spot is available in black, white, gray, and aqua. 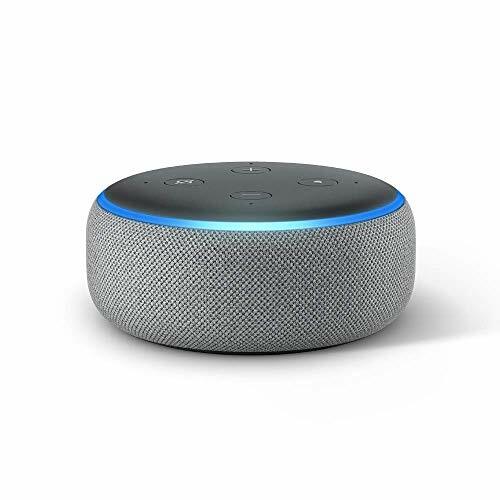 Nothing Like This offers a similar cradle for the 2nd-gen Echo Dot called This Dottie ($20 on Amazon). Unlike The Spot, it has an AC adapter built right into the device. A USB cable stub is also included. This Dottie won’t block the lower outlet in a duplex if you plug it into the upper outlet, as shown on the installation pamphlet, but the buttons on the docked Dot will be upside down. Also, the weight of the Dot might pull the AC adapter out of the outlet over time. I’d recommend plugging This Dottie into the lower outlet instead. You won’t be able to use a three-pronged plug in the upper outlet, but the Dot’s buttons will be oriented correctly. This placement, however, will be a problem if there’s a thick backsplash beneath the outlet. The one in my kitchen, for instance, is about 1/2-inch thick. The Dot didn’t look all that attractive sticking out at an angle, but the Dot was able to draw power without a problem. This Dottie is available in black or white and costs $9 and change more than the similar The Spot, but remember that it comes with an AC adapter. I didn’t have time to install this Flush Mount ($20 on Amazon), but I intend to—probably in multiples. It’s a brilliant idea that will make an Echo Dot virtually disappear into your architecture. An Echo Dot fits inside the mount, which has a flange that leaves the Dot sitting flush with your wall or ceiling. 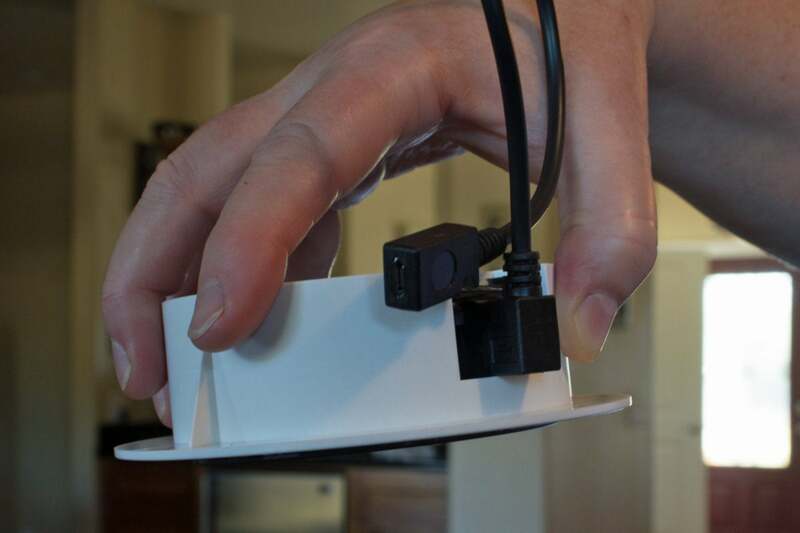 The edge of the angled USB plug and stub cable that Mount Genie provides holds the Dot in place. Mount Genie also provides a strip of two-sided tape to further secure the Dot, which I recommend using. You’ll also get an angled 3.5mm female-to-male adapter for connecting external speakers, and a 10-foot braided USB cable. Mount Genie suggests using power-over-ethernet (PoE) to supply electricity to the Echo Dot. No power supply is included, and you’ll need to purchase either a power injector or a PoE switch plus a PoE splitter that you’ll install at the Dot end of the ethernet cable (Mount Genie recommends a WiFi Texas model, which Amazon sells for about $21) if you decide to go that route. A paper template for cutting a hole in your wall or ceiling is included, which you should use with a hole saw or a keyhole saw (a drill mounted hole saw would be easier and more precise). You don’t need to install a junction box in the hole, the mount will wedge itself into the drywall. 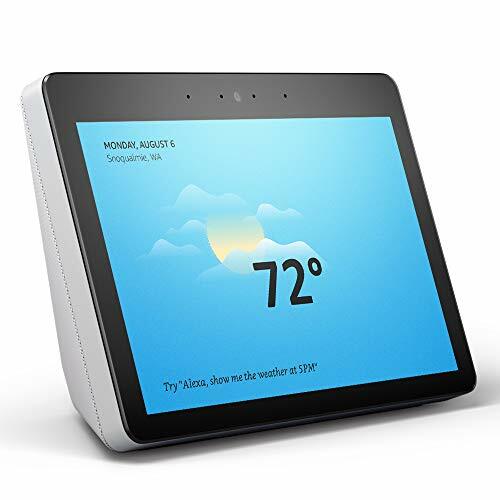 Sanus specializes in TV speaker stands and mounts, but they also have a couple of cool and inexpensive accessories for the Amazon Echo. The Sanus Speaker Mount ($15 on Amazon)—available in black or white—is a plastic mount with a silicone rim that securely cradles an Echo Dot. It’s designed to be screwed into the wall; alternatively, Sanus also provides two 3M Command Picture Hanging Strips that will do the job without damaging the wall. The Dot’s buttons will be upside down if you arrange it in the cradle so the Dot’s power input and aux output are at the bottom. The alternative is to position the Dot so that the cable power comes out the top and wraps around the Speaker Mount. You could also mount it to the side of the outlet. However you manage it, this is a slightly less-attractive solution than the outlet-mounts we’ve seen and you’ll want to wrap up the excess cable and secure it with a cable tie. Other than that, it’s every bit as effective at getting your Echo Dot off your counter or desktop. This little gadget is a combo dock and battery for a 2nd-generation Echo Dot ($30 on Amazon). 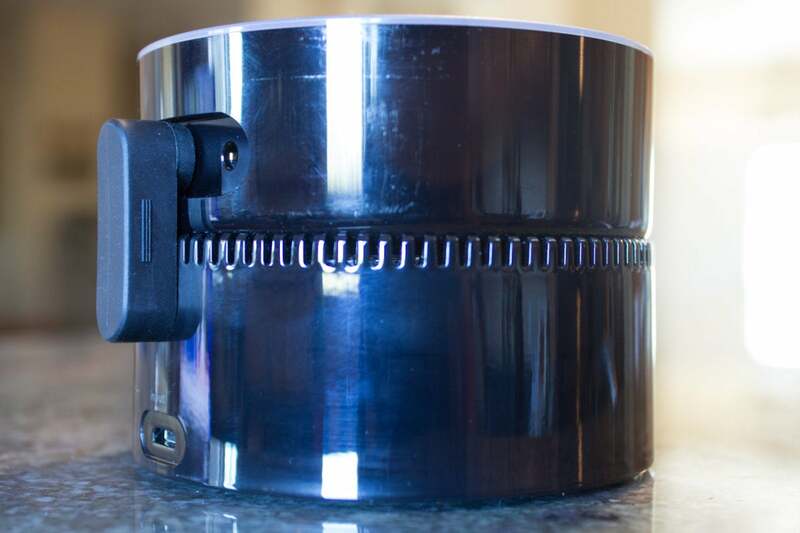 I like it better than the Fremo Evo (see below) for a couple of reasons: First, it doesn’t require you to permanently alter the Echo by gluing a metal plate to its bottom. Second, there’s a push button on its front that can turn the battery on and off. If you know you won’t need the Echo for an extended time, you can shut it down and save the battery for the times you do need it. Four LEDs indicate battery level. The 7000mAh battery is rated to last 10 to 12 hours, depending on how much you use it. The dock itself, which is covered in your choice of four woven-nylon fabrics (brown, red, dark blue, or light blue), will protect the Dot. Unfortunately, it also blocks the Dot’s 3.5mm analog auxiliary audio output. As with the Evo, you’ll need to use the Dot’s AC adapter and cable to charge the battery. 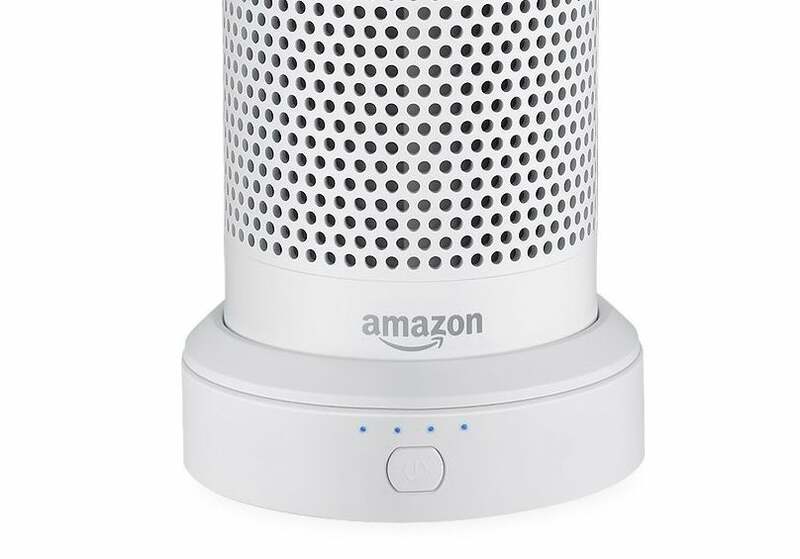 The Fremo Evo ($35 on Amazon)—available in black or white—is one of several battery options that render an Echo Dot mobile. 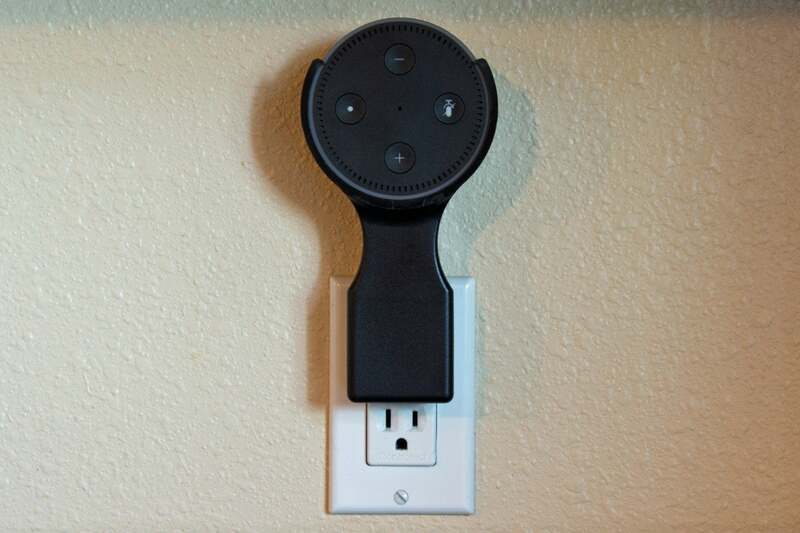 Not only do you not need to worry about the distance from an AC outlet, you can take your Echo Dot with you and connect it to any Wi-Fi hotspot. Fremo’s battery is slightly larger in diameter than the Echo Dot itself, and it comes with a metal disc with adhesive on both sides so that you can mount the battery to the Dot permanently. It uses an L-shaped connector with a Micro-USB port for the Dot on one side and pin-type connector on the other for the battery. Fremo promises six hours of battery life from its 5200mAh battery, but this will obviously vary depending on how much you use the Dot. You’ll need to use the Dot’s original AC adapter to recharge the battery, as the Evo doesn’t come with one of its own. Four small LEDs on the front of the Evo indicate remaining battery life. We’ve looked at several battery docks for the 2nd-generation Echo Dot. Ninety7 ups the ante with the Vaux ($50 on Amazon), which adds a small speaker to the mix. The battery is a 5000mAh model that the company says can power the Dot for up to six hours, depending on how often you summon Alexa and listen to music. An on/off button lets you preserve the battery for those times you actually need it. You’ll need to use the Dot’s AC adapter and USB cable to charge the battery, since the Vaux doesn’t come with its own. You can read our in-depth review of the Vaux for more details. One of the Echo Dot’s shortcomings—besides its atrocious speaker—is its lack of a display. It will tell you the time, but only if you ask Alexa first. 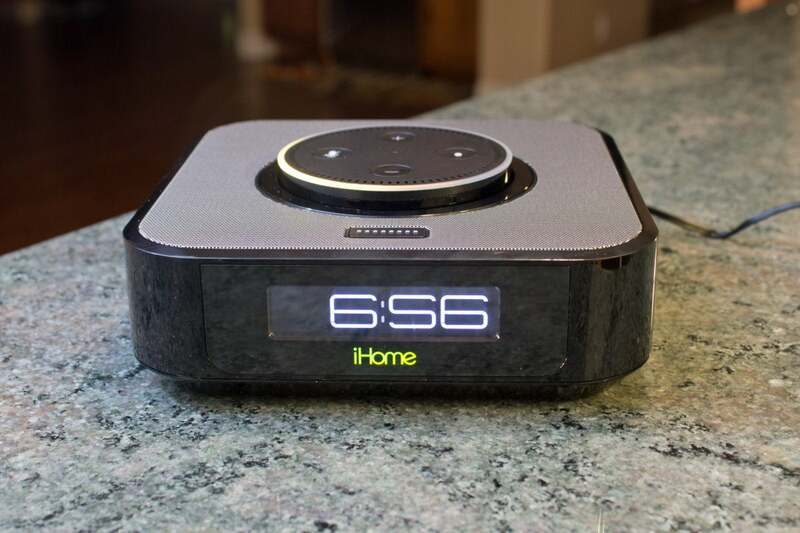 Plop a Dot in the center of the iHome iAVS1 ($50 on Amazon), and it will not only display the time for you, it will also upgrade the Dot’s speakers (just plug the 3.5mm aux cable into the Dot). The onboard speakers are a step up, but that’s not saying much. Frequency response is limited to the midrange—there’s virtually no bass—and you’ll need to listen closely to get any sense of stereo imaging. The iAVS1 also comes with a preinstalled set of AAA batteries, but these will only keep the clock going in the event of a blackout—your Dot-based alarm won’t go off. The digital clock display can be dimmed over eight stages, but it would be nice if there was an ambient light sensor that did this automatically, so it was brightest during the day and dimmer but legible at night when you’re sleeping. Lastly, there’s a USB charging port in back for your smartphone or digital media player, but it puts out just 1 amp of power. It’s available in black now and white soon. This attractive case ($6 on Amazon) will add a little flair to your Echo Dot and offer a bit of protection in the bargain. It’s covered in the same woven nylon as Wasserstein’s Battery and available in blue, brown, gray, red, and white. This and the Silicone Skin (see below) are available only through Amazon’s Add-on program: Their price tags are lower than the cost to ship them, you can purchase them only by adding them to an order of more than $25. 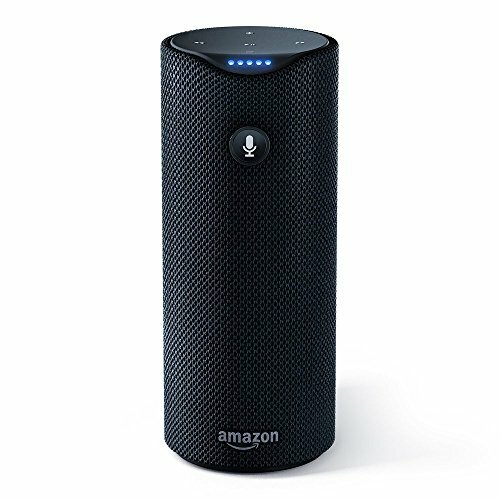 These skins ($5 each on Amazon) let you change the color of your Echo Dot while protecting it from knocks and bumps. For the $1 difference in price, I think Wassterstein’s fabric cases are the better deal—silicone is a bit of a dust and lint magnet—but you might have a different opinion. The silicone sleeves are available in black, blue, light blue, tan, and white. Like the fabric protector, they are an add-on item (see description above). If you own the original Amazon Echo, you know how easily the too-tall device can be knocked over. 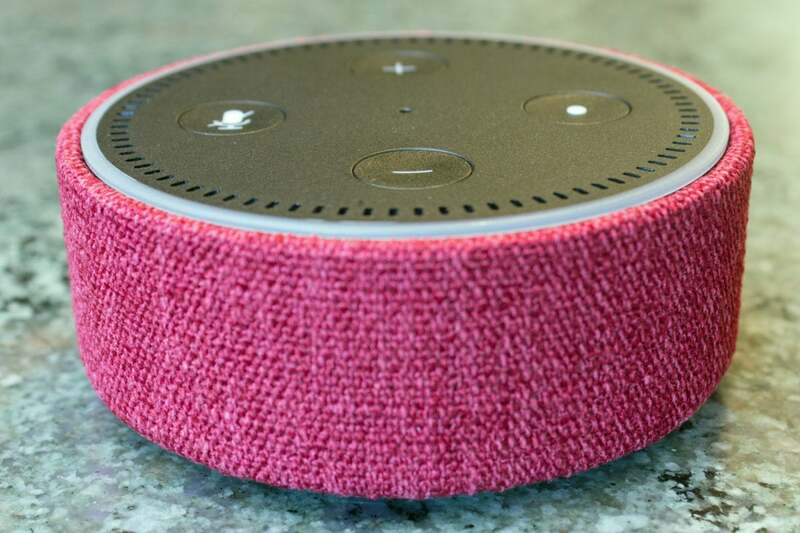 Slipping these thick bumper guards ($20 on Amazon) over the top and bottom of the Echo won’t make it any less accident prone, but they’ll at least cushion its inevitable falls. A notch in the bottom ring will accommodate the Echo’s power cord. Available in black or white, they can also be stretched to fit over the second-generation Echo, although that model is less in need of protection. 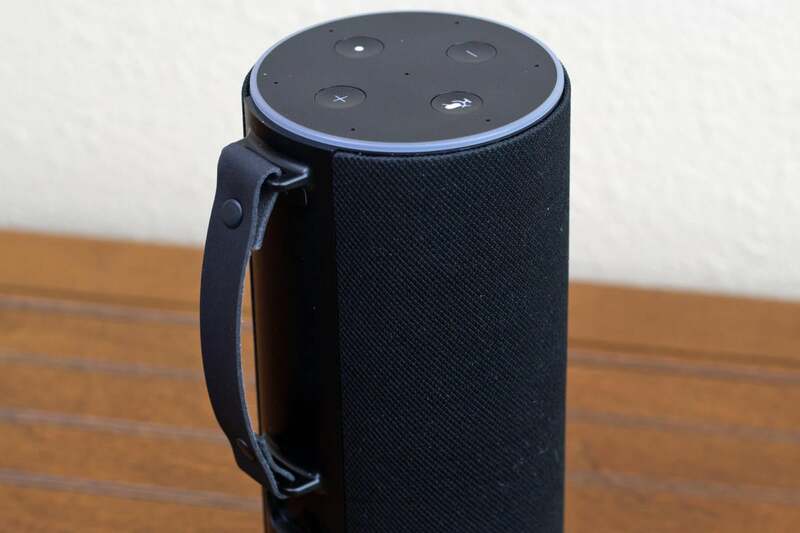 Here’s another solution for stabilizing the original Echo: The smart speaker is virtually impossible to knock over once you drop it into this acrylic stand ($18 on Amazon). 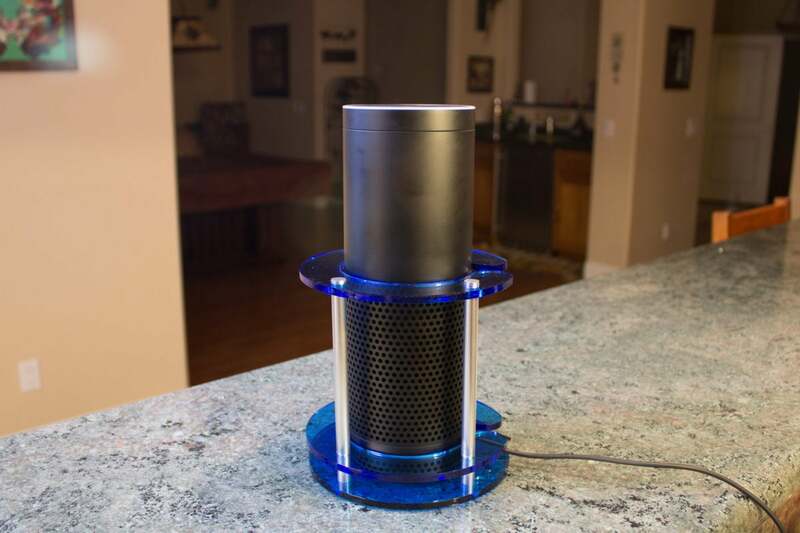 A large silicone pad isolates the speaker from the stand, and silicone feet on the bottoms of its four aluminum pegs will further prevent vibration transfer from the speaker to whatever surface you place it on. A cut-out allows the power cord to pass through. can also accommodate a 2nd-generation Echo—if you really want it to. Screw this metal mount ($15 on Amazon) into the wall and you can slide a first-generation Amazon Echo inside as if it were a wall sconce. It holds the Echo out and away from the wall at a slight angle, which makes its buttons and volume-control ring easier to use. Unlike the acrylic speaker stand above, however, there’s no padding to isolate the speaker from stand or the stand from the wall. The opening is not large enough to accommodate a second-generation Echo. 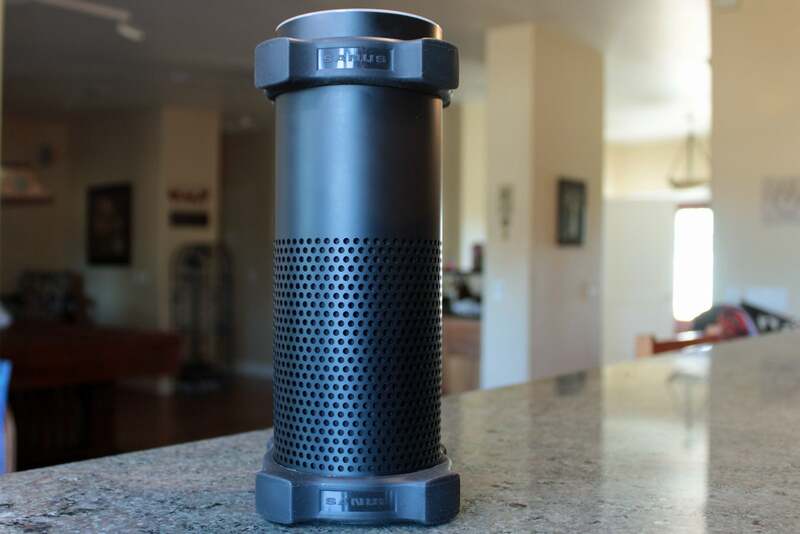 Ever wish you could take your first-generation Amazon Echo with you? Wasserstein’s Echo Charging Station ($30 on Amazon) can make that dream a reality. You plug a removable adapter into the Echo’s power port that has spring-loaded pins that contact the battery base. 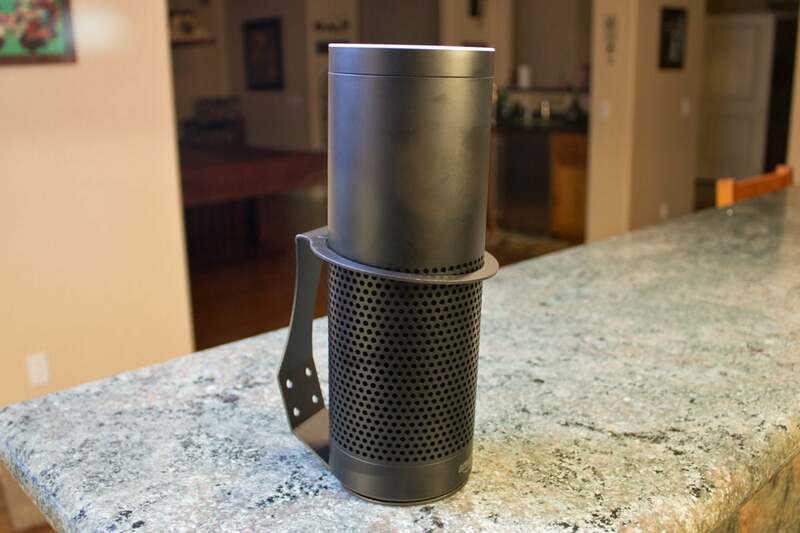 Strong magnets hold the base to the bottom of the Echo, so you can carry it around. My advice: Put a pair of Sanus Bumper Guards on it first. Like Wasserstein’s Battery for the Echo Dot, a power button on the front of the base turns the 9,000 mAh battery on and off, and four LEDs report the battery level. The battery can be charged with any 5-volt, 2-amp AC adapter and a Micro-USB cable, or you can use the provided 15-volt, 1.4-amp AC adapter instead. You can also charge your smartphone or digital audio player’s battery by plugging a USB cable into the 5-volt, 2-amp USB output on the base. And if you’re ever plunged into darkness from a blackout, there’s even a weak LED flashlight in the base. Available in white only. It sounds like a tropical cocktail, but the Amazon Tap Sling ($20 on Amazon) for the Amazon Tap smart speaker—the only Alexa-powered device that we haven’t taken a liking to—is quite handy. It will protect its host from bumps and bruises, and a large loop will also let you hang it from a carabiner, hook, or even a nail (you’ll need to provide your own). It’s a bit pricey for what it is, and you’ll need to remove it before placing the Tap on its charging cradle, but it’s available in five colors: blue, green, magenta, tangerine, and white. 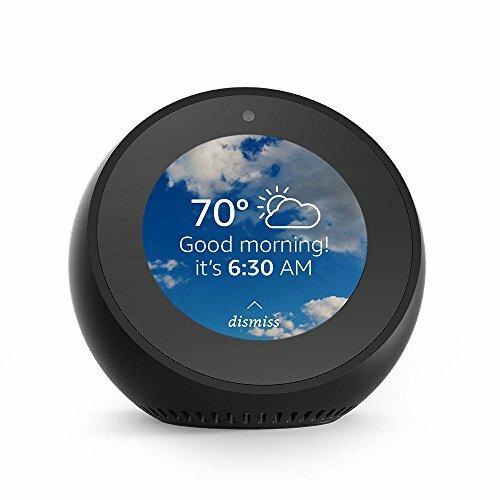 Correction: This story was updated on November 17 to clarify the price for The Spot, for the Echo Dot. This product is most useful when your electrical outlets are located in the middle of your wall, but it is a great and inexpensive idea nonetheless. 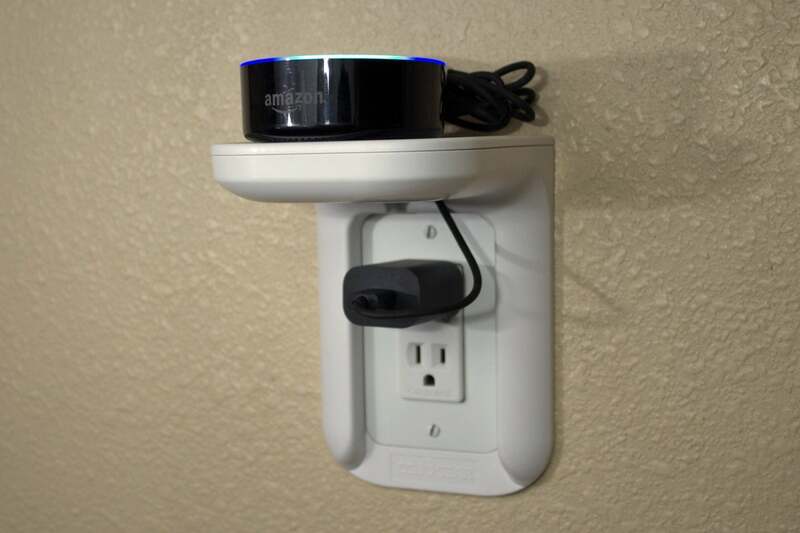 An ingenious solution for mounting an Amazon Echo Dot in your home's wall or ceiling, where it's out of the way and yet completely usable. This battery renders your 2nd-generation Echo Dot both portable and more attractive; plus, you can swap out a dead battery for a fresh one. If you really want to take your first-gen Echo on the road, this battery dock will make it possible. An easy way to mount an Echo Dot to your wall without requiring screws. 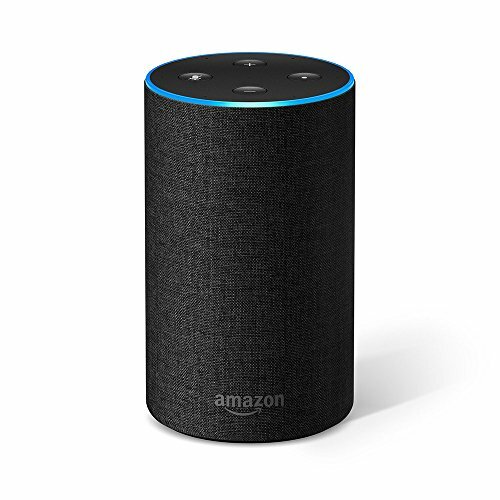 The Vaux won't wow you with its audio performance, but it does add a tremendous convenience factor to the Echo Dot and it sounds a whole lot better, too. While it's no substitute for a full display, the iAVS1 will at least show you the time without your needing to ask Alexa to say it out loud. A handy way to hang an Echo Dot on your wall without needing screws or tools, but the buttons on the Dot could end up upside down depending on how you install it. 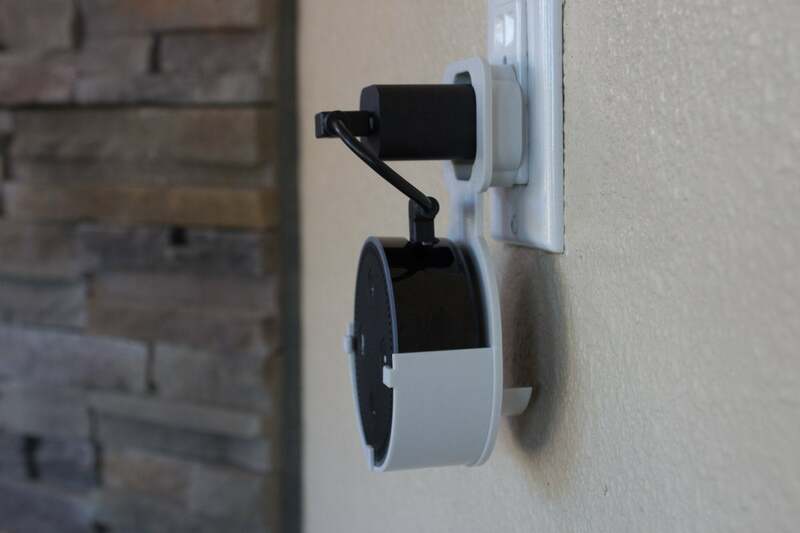 Holds an Echo Dot tightly in place on the wall and can be installed without screws. Here's another way to protect your first-generation Amazon Echo: Mount it to the wall out of reach of kids and pets.It's not the most attractive solution, though. 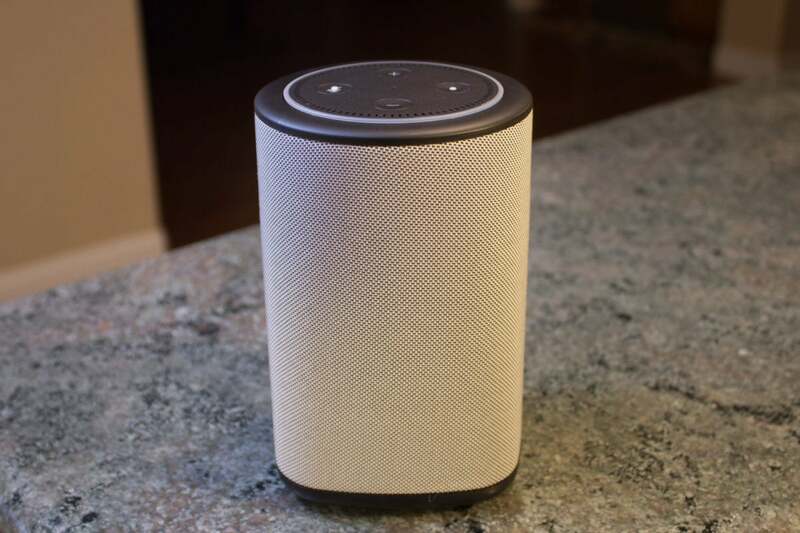 This cover seems expensive for what it does, but it's one of the few options out there for protecting this particular smart speaker. 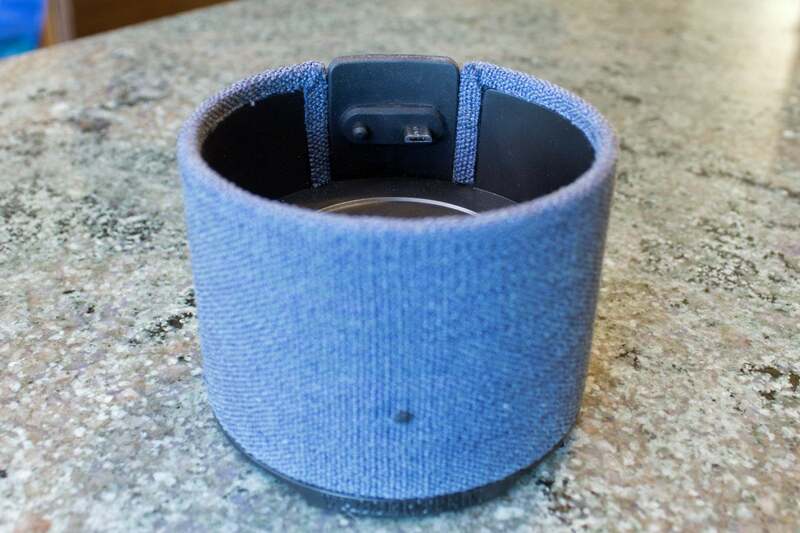 It's not the most attractive accessory you'll find for the Amazon Echo, but it will prevent the speaker from getting knocked over (and it will accommodate the 2nd-geeration Echo as well).